Yield: Makes one bread loaf-sized cake. 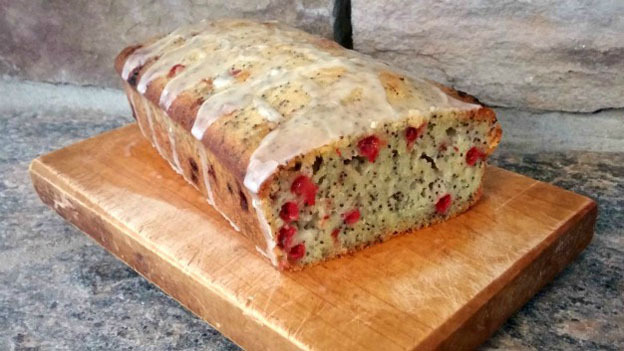 This delicious autumn olive poppy seed cake with orange icing is moist and simple to make. It boasts a fresh orange flavour, along with the wonderful taste of autumn olive berries. Add the flour mixture in two additions, alternating with the buttermilk. Add the poppy seeds. Process the batter until smooth, about 15-20 seconds. Fold in the red currants. To make the orange glaze, whisk the powdered sugar and orange juice until creamy. If needed, add more orange juice, a little at a time, until the correct consistency is achieved (thick, smooth, yet still liquid). Pour the batter into the pan and bake until the cake is firm and a tester inserted into the center comes out clean, about 50-60 minutes. Cool for an hour and drizzle with orange glaze. Let glaze set before serving.